The German mainstays began life as a death metal unit in Southern Germany. By the time of the arrival of the third album they had completed changed styles. Switching from Nuclear Blast, which reportedly was not paying the band royalties, the band lands with the fledgeling Massacre where vocalist Alex Krull finds a job as a publicist. The band has in the meanwhile turned into a seminal German rock band. Former Atrocity drummer Gernot Winkler committed suicide in early 2002. The band signed with Napalm Records in 2003. Atlantis, a concept album, was issued in the summer of 2004. At the same time, Alex Krull was hired by Roadrunner to become a talent scout in Europe. 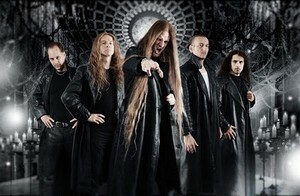 Atrocity added drummer Moritz Neuner (formerly of Graveworm, Darkwell and Abigor) to the line-up in late 2004. Werk 80 II, the band’s second covers album of '80s pop songs appeared in 2008. Drum nomad Nick Barker joined Atrocity and Leaves' Eyes in early 2008. Opiate For The Masses’ Chris "Seven" Antonopoulos joined both Atrocity and Leaves' Eyes on drums in October of 2008. Atrocity would release a new DVD, Die Gottlosen Jahre ('The Godless Years'), on March 30, 2012. The band had, in the meanwhile, lost drummer Roland Navratil and recruited a Joris Nijenhuis. The DVD featured a band documentary, a live 2010 show and the studio CD of the same. In 2012, Atrocity was working on a trilogy called Okkult. The Germans had hired Canadian sound designer Katie Halliday, who had worked for movies like Saw V, Saw VI, Saw VII, The Devil's Carnival and more to assist. Atrocity released a new EP, called Masters Of Darkness, on December 8th 2017 through Massacre Records. The EP came in advance of the Okkult II album, which was to be released in 2018 through Massacre. The band had recently re-signed with the record company.